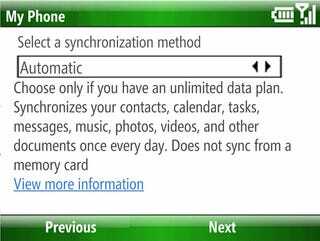 Windows Mobile fans hoping that Microsoft's My Phone over-the-air syncing service was going to be Mobile Me for WinMo can put those thoughts away. It's basically just a fancy backup service. But it works! Setup on a Windows Mobile 6.1 phone (AT&T Tilt) was easy. Just download and install the package from the phone and you can pretty much start syncing from there. The good news is, sync fairly well for the most part. Contacts, calendar and tasks are synced fine, but so are your text messages, your photos, your videos, music and documents—provided they're all under the 200MB cap. Contacts, calendar, and tasks are two-way, meaning you can create entries right on the web page. Photos, videos, music and docs are upload-able too, which makes this an easy way to transfer files onto your device OTA. Any inconsistencies (a calendar entry created on the phone went to the web fine, but one made on the web wouldn't sync to the phone) can most likely be attributed to this being a beta. The downside is that this is (by default) only really useful for backing up your phone once a day. You can only schedule your phone to back up once a day or once a week or manually. It's definitely not push and it's definitely not meant to be. This is used for making sure your contacts and other phone data are always backed up, so you won't lose everything in case someone swipes your com.